This familiar scenario forms part of the Chinese writer Cixin Liu’s “Remembrance of Earth’s Past” trilogy, a series of science-fiction novels first published in China a decade ago to widespread acclaim but translated into English only in the last four years. Liu is enormously popular in China, and the trilogy has been called “the Chinese Star Wars.” It was lauded by outgoing U.S. president Barack Obama in an interview in January 2017 as “wildly imaginative.” Amazon is turning the trilogy into a three-season television series—after purchasing the rights for a billion dollars. In The Three-Body Problem, The Dark Forest and Death’s End (Tor Books), however, readers do not find Isaac Asimov’s galaxy-wide human empire, or Ewoks dancing in triumph over a destroyed Death Star, or Will Smith lighting up a celebratory stogie after driving alien conquerors from Earth. The aliens in Liu’s universe don’t just announce, “You are not alone.” They also make it perfectly clear to humanity that when the alien spaceships arrive, they are going to wipe out the human race the same way we would stomp on bugs. The aliens know what we do not because of our ignorance and our arrogance: The universe is a nasty, nasty place. Our science fiction often mimics the storylines of American Westerns, with humans as folksy, likable, lethal John Wayne. Much of English-language science fiction also embraces the premise that the alien civilizations with which we might come into contact will not be friendly—and in many of our best known novels and movies they wreak havoc on humanity. But almost without exception, the aliens are eventually defeated by human forces, whose fighting spirit or secret technology gives the home team the win. Our science fiction often (consciously or not) mimics the storylines of American Westerns, with humans as folksy, likable, lethal John Wayne, or of tales of Roman conquest, in which humanity is civilized Rome and aliens are the barbarian Gauls. Both storylines assume that the end result of any intercivilizational encounter will be either peaceful coexistence or human hegemony. In an article in The Atlantic in December 2017, Ross Andersen pointed out parallels between Liu’s pessimistic view of the universe and the history of China itself. Having rightly seen itself as the most advanced civilization in the world for centuries, Andersen writes, in the 19th century “the ‘Middle Kingdom’ of China, around which all of Asia had once revolved, looked out to sea and saw the ships of Europe’s seafaring empires, whose ensuing invasion triggered a loss in status for China comparable to the fall of Rome.” The European empires, whose commercial entreaties and military threats had been met with scorn on previous encounters with China, had (largely by virtue of their almost constant state of conflict) suddenly vastly outstripped China’s technological capabilities. The result was catastrophic for the Chinese, and continued to be so well into the 20th century. The lesson? Never leave your enemies, no matter how backward, to their own devices. Star Wars and religion struggle with the same issue: What do you do with tradition? Patrick Gilger, S.J., Eric Sundrup, S.J. Liu includes many other historical references in his sprawling trilogy. The bloody and tumultuous Cultural Revolution of the 1960s, where callow youths competed to see who could be the most ideologically pure enemy of their educated elders, plays an important role in the trilogy’s start and general historical approach. Liu also includes references to Chinese scientists and legendary military figures whose mentions surely have greater resonance and meaning for Chinese readers than for the typical American sci-fi fan. The physics of the trilogy can be daunting, even as Liu strives mightily to make it intelligible to the lay reader. The vagaries of Einsteinian relativity, multidimensional space, string theory and more can be tough going. At the same time, the possibilities offered by the complicated physics and mathematics (for example, universes of four dimensions, or 11 or even two) allow Liu to expand his fiction vastly beyond the imaginative possibilities of Western science fiction writers like Isaac Asimov, Frank Herbert or Ursula K. Le Guin. Beyond the science and historical framework, Liu’s trilogy is also notably different from Western science fiction in the way it employs the literary tropes of the genre. Most American sci-fi is not explicitly theological in a Christian sense (one clear exception was Fred Saberhagen), but it is almost always profoundly messianic and eschatological in its themes. In Liu’s trilogy, however, civilizations (Earthly and interstellar) do not necessarily advance in a linear fashion, or even rise and fall in a predictable pattern. Ages of dazzling technology are followed by others of pastoral simplicity, while civilizations on the brink of a Golden Age are suddenly reduced to nothing or returned to rudimentary states of survival. Most American sci-fi is not explicitly theological, but it is almost always profoundly messianic and eschatological in its themes. The ultimate fate of humanity (no spoilers here) involves such fantastical possibilities in terms of scientific imagination that one wonders how Amazon can capture Liu’s dazzling universe for television. If his images can be translated creatively for the small screen, this could be a truly breathtaking series; if not, we could end up with something like “Childhood’s End,” the Syfy network’s drab and lackluster 2015 take on Arthur C. Clarke’s brilliant novel of the same name. Liu, still in his 50s, continues to publish science fiction that focuses on civilizations in peril. Though he describes himself as an optimist about humanity’s future, he noted in an interview in 2017 that “whether the future will be bright or be dark depends largely on the choices we make today.” Perhaps it is no surprise, then, that his novels are gaining such popularity in the United States in recent years. Note: This review follows the American publisher’s naming conventions, whereas in Chinese dialects the author’s name is rendered Liu Cixin. It will be interesting to watch the series. I may subsequently read the books. I have to admit, the main pleasure I get from watching and reading scifi is to look for the flaws. I remember Spock in the Star Trek series, the result of a mating between an earthling and a vulcan. Even if the two species looked alike, an earth human would more likely successfully mate with an earth mollusc. The biochemistry would probably be incompatible. I also find invasions of earth to steal our metals implausible. Why go to earth where metal ores have to be excavated, smelted and, if to be taken back, accelerated to escape velocity? Much more economical to harvest the asteroid belt or even the Oort cloud. Anyway, scifi does pop out interesting ideas. Thanks for the review. 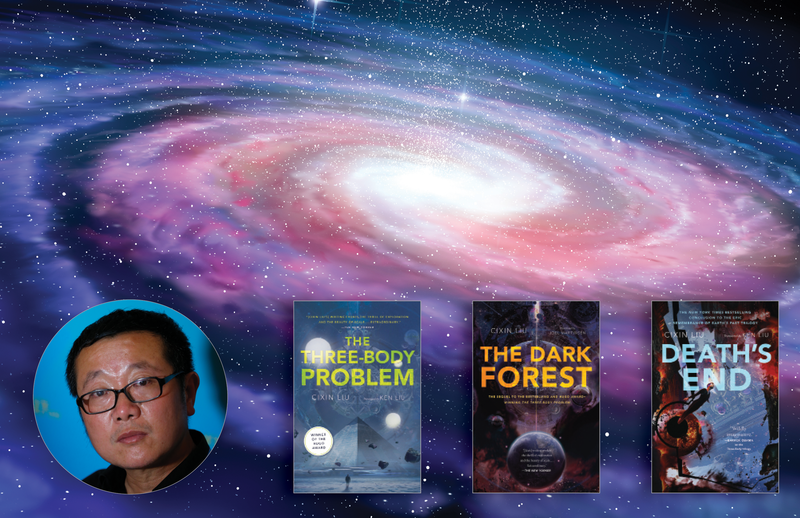 This article also appeared in print, under the headline "The otherworldly science fiction of China’s Cixin Liu," in the August 20, 2018 issue.